Over at The Truth About Guns, many people have posted pictures of the things they carry every day, and some good commentary on why they do so. But, so far, it’s all been about men and what they carry in their pockets! 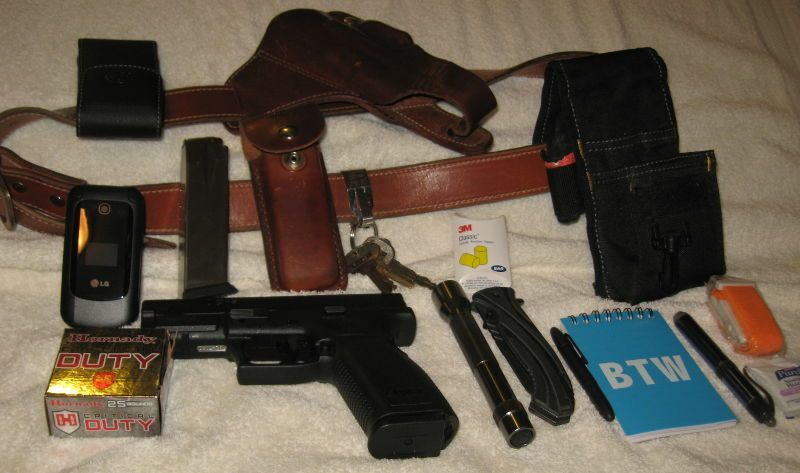 So, I thought it might be fun to show what I carry and how, as well as why. Here is the belt I wear each time I leave my back door, whether to go to town or just out to the burn barrels, tend to the horses or anything else. Because you just never know when an emergency might overtake you. Not too many criminals around here, but quite a few large, wild animals. And here is what is contained in those pouches and holsters. A simple prepaid cell phone, so I can take pictures or call for help in an emergency. The Springfield XD compact 9mm fits into the leather “desk rider” holster. Then there is the 16 round spare magazine for it, loaded with the Hornady hollow points. Of course I don’t carry the box of ammo around with me. Seems like 33 rounds should take care of most things. In the black nylon pouch I carry a flashlight, a folding knife, ear protection (just in case there is time to use it), a notebook and space pen, tourniquet and medical flashlight. The handiwipe is the latest addition. Hard to see, but there’s also a pair of black nitril gloves left on the nylon pouch in an exterior loop. These are the tools and supplies I think I might need immediately in an emergency, and not just a self defense emergency. A full first aid/trauma bag remains in the car. It is a lot of stuff! And yes, it probably looks funny to some folks, but I’ve carried it for a long time and am used to it and the occasional stare. Just as with the gun, I’d rather have it and not need it, than need it and not have it. This entry was posted in Mama's Rants and tagged empowerment, Guns, Our right of self-defense, women and guns. Bookmark the permalink. People are always commenting on my various jackets, which I often wear in the summertime. After living in both Alaska and Nevada, I’m comfortable in a wider range of temperatures than most. Why the jackets? Pockets! Probably less rational than a belt. But it’s what I do. And folks who see me pull out a Kindle or a bottle of hot sauce roll their eyes…but don’t seem to jump to the “gun” conclusion. I’m in favor of open carry, but I spend a lot of time in places where it’s illegal & creates a ruckus. The gun’s supposed to be there as a tool to deal with certain problems that may arise. If its presence is likely to cause trouble, I’d (almost always) rather it be hidden. The pocket thing works for most men, but not for most women. I’m not sure just why, but even though I prefer clothes with pockets, I can’t use them most of the time. In order to get my hands in and out of the pockets, let alone put much into them, the clothes have to be so baggy I can’t stand it. A jacket would be a better choice, but I don’t wear one very often, even in really cold weather. I layer shirts, sweat tops and sweaters most of the time, so I can cope with temperature changes in the overheated stores and homes I visit.